Much of what is written in the parallel Gold Market update applies equally to silver, and it will not be repeated here. So we will proceed to look immediately at the latest silver charts. Silver was a sideshow on Friday, as it was gold that came under an orchestrated attack, being driven down first in the Far East before waves of selling in New York took it lower and lower towards critical support, before it was dealt the knockout blow by the London physical market suddenly freezing up in the afternoon, sending holders of bullion into a blind panic and mad scramble to protect themselves in the futures market. Silver was sideswiped of course and the collateral damage it suffered resulted in it breaking below a remarkably clearly defined and strong support level by the close, as we can see on its 3-year chart, a development which has set it up for a potentially brutal selloff and vertical plunge next week, as this has and will trigger stops clustered in this area, and we can expect hapless traders to be driven towards the exits by margin calls sent out over the weekend. 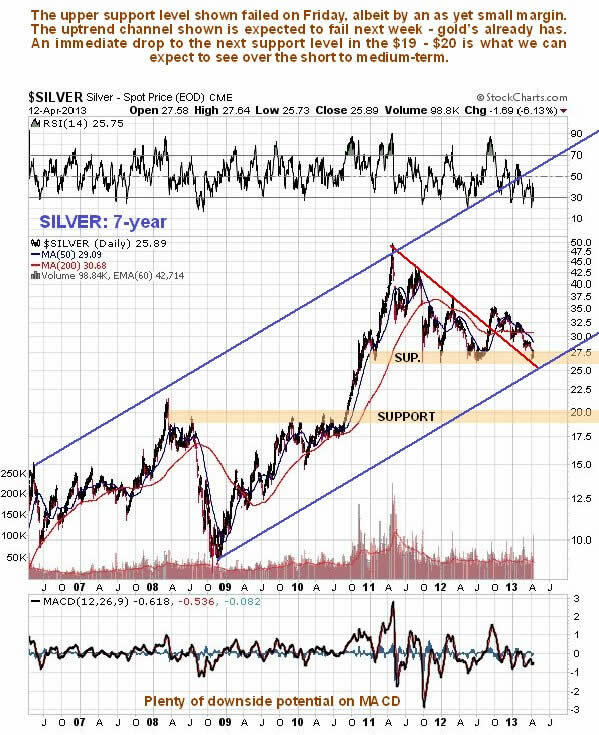 On its 7-year chart we can see that, having breached its key support, there is not much but air below the price of silver now. It is almost a foregone conclusion that it will now break down from the long-term uptrend channel shown, as gold has already on Friday, and drop steeply back to the next major support level, which happens to be in the $19 - $20 area. COTs and sentiment for silver are already at levels that we would normally consider to be very positive, and we did consider them to be positive until this happened, although, being aware of the danger of failure of the key support and its consequences, we had taken steps to insulate ourselves from harm in the event of it failing as it has. 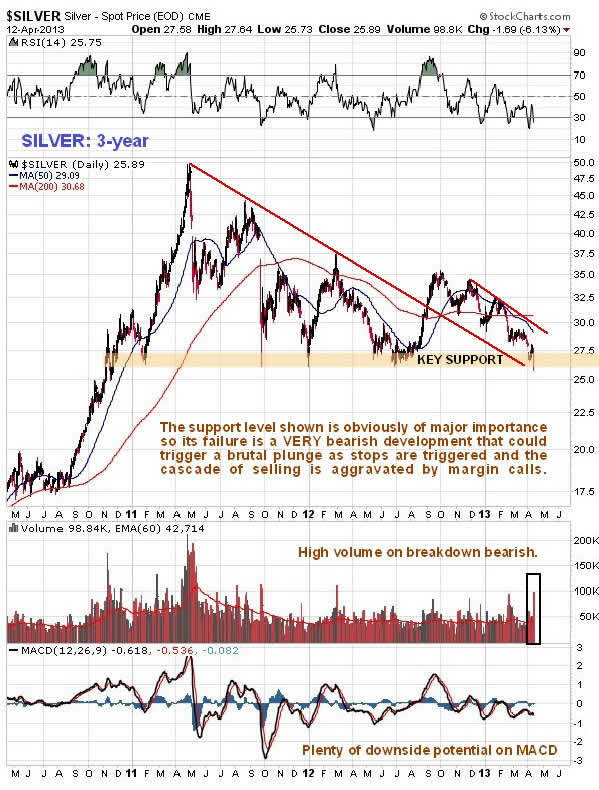 What this means is that if silver now drops steeply towards its next important support level, we can expect COTs and sentiment to get even more positive, and to be useful in helping us to determine when the bottom is in.